I am learning to use figurative language features in my writing. I find it easy because i know what a noun is. My next step is to do harder language features. We have been learning to read out loud using expression. We need to look at the punctuation to help us use expression. When there is an exclamation mark we make it sound louder and interesting. We read a play to practice and then recorded it on Puppet Pals. I found this easy because I know the expressions of the punctuation. My next step is to do more plays. Last week, Room 28/29 started on a project about the New Zealand flag about should we change the New Zealand flag or not. There is 6 challenges: Challenge 1 is the challenge with lots of flag and you need to name it, Challenge 2 is the challenge that you need to find the countries that you find on challenge 1 on a world map, Challenge 3 is you need to read a article and then complete a quiz about the about why we have the national. Challenge 4 is to read a article and complete a mind map. Challenge 5 is to complete a PMI about why we should change the New Zealand flag or not and the interesting thing that you find out. Challenge 6 is to design a flag for our school. And that was all of the project. Overall, I am enjoying this project and I am looking forward to design the flag. 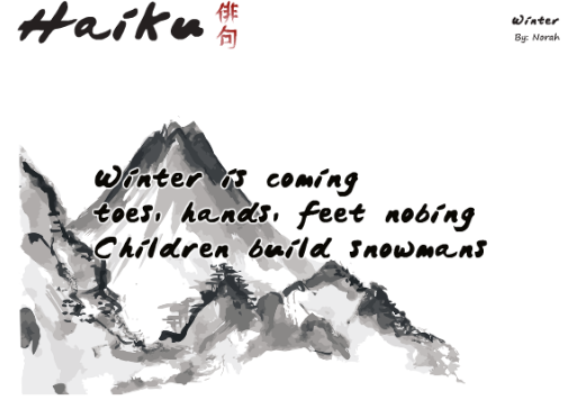 I was learning to write a Haiku poem. I had to write my own Haiku poem. I find it was easy because it was short. My next step is to write a more harder Haiku poem. Have you seen a Tigerlion? Do you know what a Tigerlion is? Well, of course you haven't seen on because the tigerlion is made up and you of course don't know what a Tigerlion looks like, but you might think it is half tiger and half lion but actually is third lion and two thirds tiger. It has a tiger fur and a tiger tail and a lion head with yellow hair and sharp teeth in the mouth, sharp as swords claws it can get you in one bite and it can quickly gobble you up. That was my animal. I was learning to write an explanation. I find this easy because I know what to do to make wind chimes. My next step is to write more explanations. I have been reading Too cool cricket legend. I have done this book review to tell what happened in the story. I find this hard because I can't really tell what happened i the story. My next step is to practice on my retell. Last last week Mrs Melville and Mrs Graham introduced the about the SDL levels. SDL is short for Student Directed learning and there is levels 1-4 on that. Level one is recruit and that is teacher directed learning so in recruit the teacher tells you what to do and the teacher check you work when you are done that is the beginner of SDL level. Level 2 is Rookie has a master that is the level 4 people tells the rookies what to do and they checks their work before they go to the teacher. Level 3 is scholar which is really independent and works by them selves. Level 4 is master and the master is really, really, really, independent on their work and they have a buddy that is from level 2. The teacher put up the levels that we are on and I am surprised that I am a master and I can mentor people. At the beginning I find it really hard and now I find it easier. Overall I thought that it was really fun. I am looking forward to do more of the fun tasks. I was learning to write a simple explanation. I now know how to write a simple explanation. I find this easy because I had made milkshake before. My next step is to write a harder explanation.